Leading vendors in the global consumer beverage packaging market are concentrating on enhancing their product portfolio in a bid to gain a competitive edge. Some of the leading companies in the market, as profiled by a Transparency Market Research report, include Subaru Corporation, Ryobi Limited, Lifan Industry (Group) Co., Ltd, Briggs & Stratton Corporation, Wuxi Kipor Power Co. Ltd., Toshiba Corporation, Hyundai Motor Company, Generac Holdings Inc., Champion Power Equipment, Inc., Yamaha Motor Co., Ltd., and Honda Motor Co., Ltd. 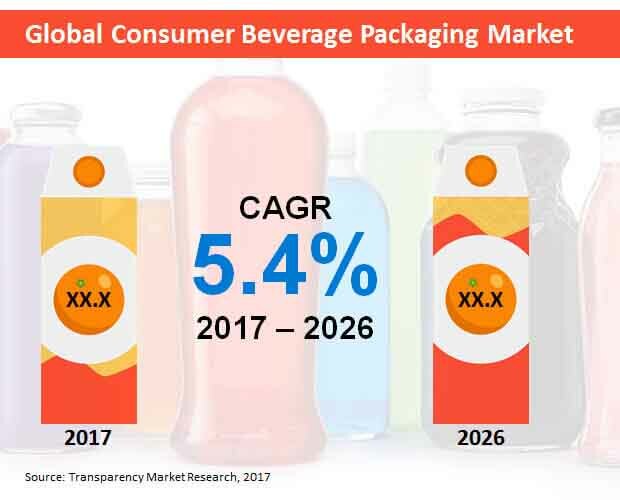 According to a Transparency Market Research (TMR) report, the global consumer beverage packaging market is expected to witness an average expansion, with sales increasing at a CAGR of 4.7%, in terms of volume, during the forecast period. The global consumer beverage packaging market is estimated to bring in more than US$ 130,000,000 Mn revenues by 2026-end. The consumer beverage packaging is witnessing evolving trends that are likely to impact the brand packaging design and also influence the way consumer interact with packaging for beverages. Personalization is one such trend that is growing in the beverage packaging on a faster phase. Brands are engaging with customers on a more personal level by offering personalized experience. For instance, companies introducing personalized bottle with names for some special occasions, making customer feel more connected with the brand. Meanwhile, lightweight bottles and cans are also becoming popular among various brands, thereby offering convenience to the customers and saving cost on the raw material for brands. Manufacturers in the beverage packaging market are also focusing on partnership and acquisition of firms specialized in product design specialized. This is expected to help in expansion of product portfolio with unique offering, thereby attracting customers. Advanced robotic machineries are also finding place in beverage packaging companies to reduce wastage, boost the production process and reduce errors with the help of real-time data collected on various stages in the production process. Also, the focus on packaging that can keep beverage fresh for a long time with any preservatives is also increasing. Bottles and cans in range of sizes with easy-to-open feature are also being introduced in the market. The trend of transparent packaging and clear packaging is also rising, enabling customers to actually see what product looks like. The consumer beverage packaging market is slated to record the fastest expansion in North America, in terms of value and volume, through 2026. In terms of value, the market will register similar CAGRs in Asia-Pacific excluding Japan (APEJ) and North America through 2026. Revenues from consumer beverage packaging sales in North America however will account for the largest market share during the forecast period, followed by Europe and APEJ. In terms of value, the markets in Japan and Latin America are projected to rise at nearly equal CAGRs through 2026, with Latin America estimated to remain relatively more lucrative than Japan for the consumer beverage packaging market’s growth. Paper & paperboard will continue to be sought-after among materials for consumer beverage packaging, followed by metal. Revenues from use of paper & paperboard for consumer beverage packaging will account for more than two-fifth share of the market by during 2017 to 2026, in terms of revenues. Containers (plastic containers, metal cans) are anticipated to remain preferred packaging type in the market. Revenues from sales of containers (plastic containers, metal cans) are estimated to remain significantly larger than those from all the other packaging type segments combined. Although bottled water is expected to remain dominant among applications in the global consumer beverage packaging market in terms of value, revenues from carbonated soft drinks application will increase at a relatively higher CAGR through 2026.